Originally called “Dry Town” then later named River Heights, this town overlooks the Logan River. 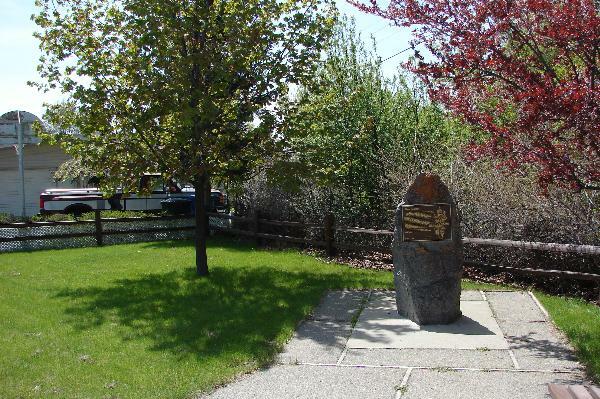 The first settlers, arriving here in 1883, were the families of Anders Anderson, Mathias Lundberg, Hyrum Merrill, Christian Hansen, Knut Hansen, Peter Croft, Moroni Gudmundson, Alma Cummings, and the Croftmans. In 1887, the families of Lars Larsen and Eric Lehi Olson arrived. The first bridge across the Logan River was built in 1891. On May 4, 1908, the River Heights Ward of the Church of Jesus Christ of Latter-day Saints was organized, with Eric Lehi Olson as its first bishop. In 1910 the first chapel was built. The first school house was erected in 1912, with Loyla Raymond as the teacher. The first mayor was J. Karl Wood. 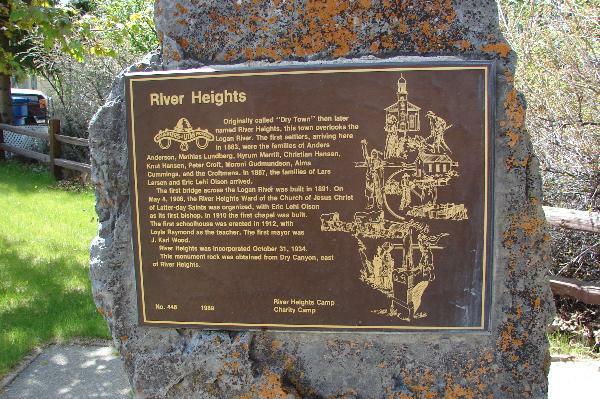 River Heights was incorporated October 31, 1934. This monument rock was obtained from Dry Canyon, east of River Heights.